Fight Sport Industries and Dan Green return and affirm what is becoming common with the United Kingdom’s biggest promoter by bringing an equally big card. 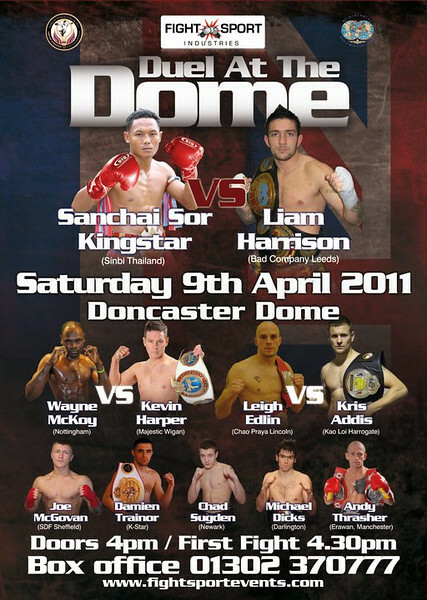 As hyped many times prior Saenchai Sinbi Muay Thai will return in a 2nd match between he and UK standout Liam Harrison. Saencahi has in the past commented on how he enjoyed his first fight with Liam Harrison because Harrison would use the same technique that Saenchai would use on him. Both have been very busy with Harrison competing in Thailand in the very well received Thai Fight super tournament where he fought and defeated Japan’s Soishiro Miyakoshi but was disqualified for not making the required weight limit. Notably Harrison still defeated Soishiro by knockout. For his part Saenchai has been busy in Thailand fighting again and defeating Nong-O though the fight was notably closer with some critics viewing the fight in favor of Nong-O. Despite being injured Saenchai has acknowledged that he is healing quickly and should be fit for competition against Harrison. Call 01302 370777 for tickets, reportedly the show is selling out fast. ~ by fatsoking on March 9, 2011.
this is the damn card we need in america!!!!! Well the one time Saenchai came to America was due to Montri via Songchai. Dennis Warner got to use him for his promotion along with Kaoklai. In all honesty I don’t know if most American fans know the 2 of them or really care. And really for the USA to have meaningful fights more often our home talent has to be developed the way Harrison got the opportunity to develop into as sharp as a fighter and as well known as he is now. A favorite rant I know but Americans need more opportunities to fight and if it cannot happen in the USA it has to happen for them elsewhere. It might be kind of how Winky finally got acknowledgement in international boxing: by becoming the road warrior and perpetual away team. 2. Most people here just don’t know Muay Thai as well as they do in the UK, France and well a lot of places – as a broad sweeping generalization with many exceptions. youre absolutely right. yeah there isnt a guaranteed show at all. and promotion efforts dont really reach too many people not specifically looking to watch thai superstars in a FTR bout. i was just saying that for selfish reasons, but on the other hand it does take some risks in order to try to get muay thai big in the usa. having been at that fight and experiencing the crowds roar, energy, etc i could guarantee they will never forget who kaoklai and saenchai are. man that fight brings back so many awesome memories…from being at the initial press conference to being at the fights and giving kaoklai a thumbs up that he acknowledged by wai’ing to me. seeing those two at once was mad overwhelming for me..
i hope saenchai and liam are at 100%, what a fight that’s gonna be (again). rungravee vs damien trainor is gonna be awesome as well! Hey, nice find! Thanks for this jake!